The show is now available on demand via Stitcher Radio! Stitcher is a great service that allows you to discover and stream lots of awesome audio content in addition to many of your existing favourite shows. 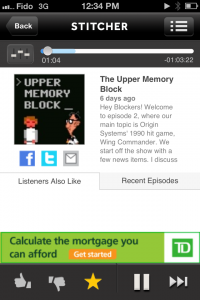 So if you don’t feel like syncing and downloading your podcasts or maybe just want a cool new way to listen to the Upper Memory Block, check it out at the Stitcher link below (or click the screenshot). Also, right now the show is being featured on Stitcher’s Welcome page, which can be accessed from any of their mobile apps. Thanks guys!